My twins have a birthday coming up. Friends and relatives are asking what the girls want. They have enough clothes and toys and many of those barely get used. When I think of the best gifts, they are the kinds that create memories and provide experiences. Subscription boxes make great gifts for just those reasons. They provide children with all the tools they need to have an experience. The experience may be educational, artistic or just plain fun. These make great gifts for the kid who has everything. We have had the chance to test out a number of subscription boxes – some great, others not so much. I decided to assemble a list of The Best Subscription Boxes for Kids to help those who might be looking for a perfect gift for a child. What’s better than the gift of creativity and family fun? For more fun gift ideas check out Best Subscription Boxes for Boys and 20 Gifts for the Budding Artist. Most of these subscription boxes include shipping and handling in the cost. When they don’t, I have indicted it under subscription options. All prices were current at the time of this writing, but they may change at any time. KiwiCo were the first subscription boxes for kids that we ever received. As a former teacher, I was really impressed with the quality of materials found in KiwiCo. These kid tested activities were designed by a community of parents. They are perfect for busy or working moms. Some moms have told me that they want to do activities like I do on Mess For Less with their kids, but they just don’t have to the time to go buy all the supplies and prepare them for the activity. KiwiCo is the perfect solution. Every month your KiwiCo will focus on a particular theme like Colors, Dinosaurs or Gardening. KiwiCo offers a variety of projects ranging from crafts, imaginative play, science experiments and more. KiwiCo offers a variety of boxes includes ones for babies and toddlers. You can get boxes focused on art, science and geography and culture. KiwiCo offers a number of subscription options. Monthly subscriptions are $19.95 per month. A 6 month subscription is $18.50 a month. This subscription box takes the intimidation out of doing science with kids. The Spangler Science Club delivers amazing hands-on science to your door every month. These make great STEM gifts for budding scientists. Each month, your child will receive the most amazing science experiments delivered to your door. A new theme will be explored every month such as kitchen chemistry, the power of air or bubbling potions. Ideal for kids in grades K-6. The Spangler Science Club offers a variety of subscription options. You can get a $14.99 per month box that includes 1 STEM experience. At $19.99 a month you’ll get up to 5 STEM experiences per month. For $29.99 a month you’ll get up to 10 STEM experiences per month. 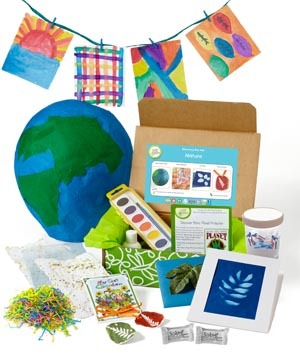 Green Kid Crafts is an earth friendly monthly craft subscription box for kids that sparks creativity while teaching kids a respect and love for the environment. These boxes are themed and each month will be filled with fun projects and creative activities than can be enjoyed by kids from ages 2-10. Since Green Kid Crafts is an earth friendly company, they use sustainable, safe materials in all of their products. They also give a portion from each sale to environmental non-profits. A monthly subscription is $17.95 per month. These boxes are presented in partnership with Popular Mechanics so you know you’ll be getting some great stuff each month. Kids will love Groovy Lab in a Box because it contains everything they need to do experiments focused on science, technology, engineering and math (STEM). Kids will get all the supplies they need to complete the activities in addition to a cool lab book. Monthly subscriptions are $29.95 a month, a prepaid 3 month subscription is $28.95 and a 6 month prepaid subscription is $27.95 per month. If you love to travel then the is the perfect kit for your child. My kids love to explore the country and world and this subscription box contains so many engaging activities for kids. I think even kids who haven’t traveled would enjoy getting the world delivered to their mailbox. Early Explorers is for kids 3-5 and explores a new world theme every month such as dinosaurs or oceans. Starts at $16.95 per month. World Edition is for ages 6-10 and focuses on a different country each month with souvenirs and activities. Starts at $12.95 per month. USA Edition is for kids 7-12 and teaches about two different states each month. Starts at $12.95 per month. Science Expeditions is for kids 9+ and contains science experiments and experiences starts at $18.95 per month. 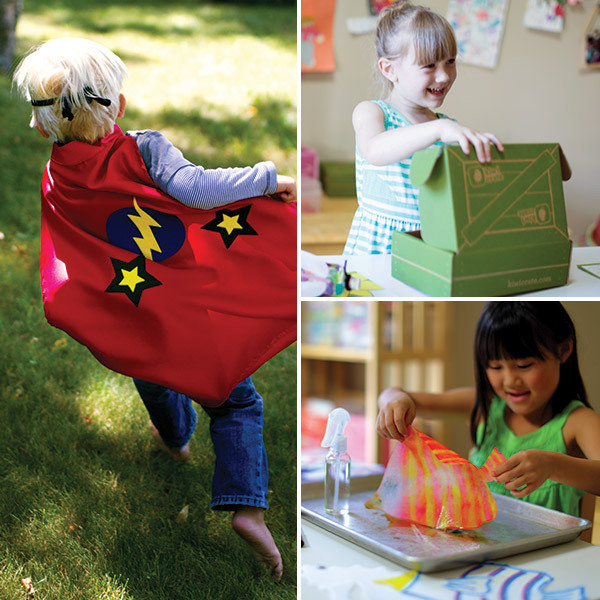 Specifically designed with kids ages 3-6 in mind, these magical, imaginative play boxes are perfect for the child who loves to create, learn and explore through dramatic play! Each box includes over 4 educational crafts and activities. They have fun themes such as Crime Stoppers, Junior Chef and Mad Scientist. Give the gift of reading! With Reading Bug Box, each month your child will receive beautiful books that have been handpicked for your child’s age and interests. With books that range in age from newborn to independent readers, there is something for every kid. In addition to the books, your child will receive gifts and extras that have been matched to the theme of the box. Reading Bug Box personalized for a child ages 0-13 – $29.99 monthly, $28.50 6 month prepay, $27.00 12 month prepay. Baby Bug Box curated for ages from $18 per month. If you have an animal lover at home or a child that loves to explore and learn, this subscription box from National Geographic kids will be a big hit. My kids love reading National Geographic Kids books and these subscription boxes for kids contain the same quality you have come to know from the books. Each month, kids will receive a mission to rescue an endangered animal in a new part of the world. Each box includes curated activities and accessories to complete the adventure. Best for kids ages 5-11. Each box provides 5-10 hours of learning, creativity and fun! Boxes are also available with a Disney princess or Hot Wheels theme, so there is something for every interest. 1 box is $24.99 per month, 6 months of boxes are $143.94 and 12 months of boxes are $275.88. Trying to get your middle schooler interested in reading? This is your box. Each month, kids receive a brand new middle grade novel, plus 3-5 fun and unique items based on the monthly theme. Your child will get hard cover books, exclusive items and 3-5 extra items each month. Give the gift of coding! Every month, kids will receive a new coding concept. If coding isn’t your thing, you can get unlimited email help with any subscription. Kids ages 6-12 will be able to pick a coding project, then they type the code into the Bitsbox website and watch as they run their app runs on phones and computers. Perfect for creative, techy kids! Basic Bitsbox from $24.95 a month. Deluxe Bitsbox from $37.95 a month. There is also a digital version for $16.95 a month that lets you download PDF’s that you can print yourself. Are you looking to get your child more engaged in learning and educational activities? MyEduCrate delivers educational themed items monthly to kids ages 6-11. They will get learning challenged, hands on learning materials, non-fiction readers and resources selected by certified teachers. I like how this box contains supplies that can be shared between two children. This is great for multi kid households as both kids can make the crafts. The boxes contain 2-3 crafts and easy to follow photo directions for a stress free creative experience. This best for kids 3-9 years old. As a kid who had penpals growing up, I LOVE this box. Each week, your child will get a letter. Think of how important they will feel as they run to the mailbox each week. Kids will receive story-telling letters that include cool animal facts, geography and fun adventures. Included in the letter will be stickers, trading cards, secret codes, and souvenirs. This is truly a gift that keeps on giving. If your child isn’t the most patient, and waiting a month for another subscription box seems like forever, this is the box for them! It also promotes reading time as kids will be excited to read their letters. We are readers in our house, so this subscription is near to my heart. Bookroo enables and empowers parents to instill a love of reading in their children. Each subscription box contains either 3 board books or 2 picture books. The books are carefully chosen and aim to be hidden gems that you probably haven’t heard of rather than popular children’s books. One of the things I love about Bookroo is the fact that the combined retail value of the books always exceeds the subscription price! A monthly subscription is $19.95 a month plus $5 shipping while a six month subscription is $16.33 per month plus $5 shipping. These boxes are perfect to help kids with sensory processing. All kids would enjoy this box, but it would be especially helpful for those with sensory needs and those on the autism spectrum. Each month, your child will receive 5-7 sensory toys that encourage the development of sensory skills and are calming and therapeutic. The items kids receive will include putty, aromatherapy dough, hand fidgets, tactile/ textured toys, etc.